A Fourth of July Tribute To George Washington and the Marquis de LaFayette, and to Some Strong Americans, Norreese Lamar Haynes, Colonel Rhett B. Griner, & Firefighter Eric (Tiger) Jensen. | Georgia Teachers Speak Out! ← A Fourth of July Articles Is Coming Up! Happy 4th! The Article Is A Big’un! A Fourth of July Tribute To George Washington and the Marquis de LaFayette, and to Some Strong Americans, Norreese Lamar Haynes, Colonel Rhett B. Griner, & Firefighter Eric (Tiger) Jensen. Norreese Haynes (center) with State Representatives Frank I. Bailey (L) and Darryl W. Jordan (R) at the MACE Office. Well…today is July 4, 2011. The Fourth of July, the proverbial birthday of our country, a day when our Continental Congress officially approved of a document setting forth the declaration that the English Colonies would no longer be subservient to a far-away country, albeit the strongest empire of the day, and ruled by a despot, King George III. This sublime document also sets forth the reasons which caused such a momentous separation, but not before espousing a revolutionary concept of the ages…that it is “self-evident” that “all men are created equal” and that they are “endowed by their Creator with certain unalienable Rights, that among these are Life, Liberty, and the pursuit of Happiness.” This thinking was indeed revolutionary, and ole King George III was not going to take such impertinency from these rebellious Colonists lying down. The fighting had already begun at Lexington and Concord in 1775, and it would continue until British General Cornwallis and his troops were surrounded at Yorktown, Virginia by the American Militia by land and the French Fleet by sea. (The Marquis de LaFayette, along with Benjamin Franklin, had used their persuasive powers in the French Court, and the French Fleet arrived just in time.) But, before this notable occasion at Yorktown, the American soldiers and colonist had suffered immeasurably for six long years of war. General George Washington held the troops together when they were receiving the most meager pay or no pay at all. We tend to focus on the Winter of Valley Forge, Pennsylvania when soldiers were starving and trudging through the snow and ice bare-footed and having limbs removed because of frostbite, but there were many Valley Forges during this harrowing war for our Independence. Freedom came with an awful price. Freedom was not free. It never has been free. This leads me to my thinking about one of my friends and colleagues, Mr. Norreese Lamar Haynes. I think about how he and his family struggled mightily in their pursuit of Life, Liberty, and Happiness. I first saw Norreese (I will used the first name because he is my friend and colleague) at football practice at the old Jonesboro Jr. High School football field on off Fayetteville Road in downtown Jonesboro in the Summer of 1982. He was gangly and did not possess an overabundance of athletic talent. He was sporting some football pants which were a couple of sizes too big, and I remember Norreese constantly tugging on the belt to keep them up. He was a cheery child and always had a smile on his face. I knew nothing about him or his family. He was one of the many boys on the Seventh, Eighth, and Ninth Grade teams. He was a Seventh Grader and had just turned twelve years of age that summer. I taught Georgia History, Geography, and Minorities, the latter course being a mini-course of six weeks. So, I taught just about every Seventh Grader in the school via this Minorities course. I had already organized my Eighth Grade Georgia History classes by counties. If you earned a seat at the front of the row, you were named the “Sheriff” of your county, and I gave considerable powers to the sheriffs of each county. (One student, Eric Jensen, who went on to the named First Team All-State in football in Georgia‘s highest classification and signed a football scholarship to Purdue University, one regaled several years later: “Coach, do you remember when I was Sheriff of Johnson County?”) The sheriffs took their jobs and responsibilities seriously and made sure that the students in their rows/counties behaved properly. If not, they would petition me to send the misbehaving student to “Tattnall County.” Yes, Tattnall was our “prison.” (Tattnall County in Georgia houses Georgia‘s most ominous prison, the Reidsville State Prison, where Dr. King was taken in 1960 when charges were trumped up against him. Presidential Candidate John Kennedy called Dr. King‘s parents, offering his condolences. Vice President Richard Nixon waited until next day to call. Too late. Martin Luther King, Sr., Daddy King, announced that he has a suitcase full of vote for John Kennedy. At the time, Black voters generally were still loyal to the Republican Party.) Our “Tattnall County” in our Georgia History classes had a warden and was located in the back of the classroom. When any student was sent to “Tattnall,” he or she could not laugh or have fun with the rest of the class. The first girl sent to “Tattnall” went to the Counselor trying to get out of my class, and she liked me! Ha! This was the kind of stigma that being sent to “Tattnall” carried. It seems that the whole 8th Grade class at J. J. H. S. was talking about Julie ______ being sent to “Tattnall County.” Even some parents kept up with which kids were in “Tattnall.” Those were the days, and the kids loved it! They also behaved. Each Georgia History class had a Speaker of the House, a Secretary of State, and the students elected a Governor in each class. We had a U. S. Senator elected by all of the classes to oversee the operations. This was a very prestigious position. Only one U. S. Senator. The students in all of my Georgia History classed elected Rhett Griner to be their U. S. Senator. Even though there were some aborted uprisings against Rhett, he maintained his control. I allowed the students to organize a petition drive for “recalls elections,” but if the person being recalled found out who was behind such activities, he would come to class and inform me that he or she wanted “to make some changes.” I gave real power to the Sheriffs, the Governors, and the U. S. Senator. Senator Griner might say: “Coach, I need to make some changes. I want to remove Sheriff Bailey from Fulton County and send him to the last seat in Treutlen County.” It was a done deal. Mr. Bailey would have to dejectedly remove all of his books and so forth from his desk at the front of “Fulton Count,” and the erstwhile Sheriff of Fulton County suddenly saw himself a lowly citizen of Treutlen County. This tended to put a check on the uprisings. Ha! Rhett, a very likable and facile kid, could win over his fellow students with charm but also by “the sword,” if he had to. Rhett was a good athlete too. All the students liked Rhett, black & white, rich & poor, male & female. He went on to receive a Congressional Appointment to The Academy at West Point and made Lt. Colonel by the time he was forty. He is still in the U. S. Army, after several tours in Iraq. He and his beautiful family live in Columbus, Georgia as he is stationed still at Fort Benning. 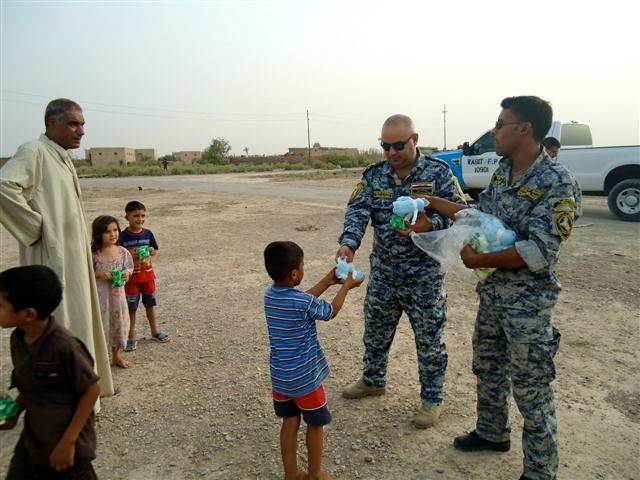 Colonel Rhett Griner and his men creating good will by giving Beanie Babies to the children in Iraq. I say all of the above to give you a feel of how my classes were organized. In my Minorities Class, I remember organizing them by churches and cathedrals. In the class that Norreese was in, I had pastors, monsignors, et al. (Norreese was in another teacher’s Georgia History Class.) Norreese was very mischievous but not in a malicious manner. He received many paddlings at Jonesboro Jr. High School — he perhaps had the school record. The students kept telling me that “Norreese broke Mr. Wilson‘s paddle.” (Mr. Wilson had been Norreese‘s principal at J. W. Arnold Elementary School in Jonesboro.) I had decided early on that I was going to appoint Norreese as the Bishop over the entire class. I did, and he took this position seriously. When I was giving out the Minorities books and writing the students’ name in the books and assigning a number to the textbook, since Norreese was sitting right next to me and facing his flock, I gave him his book last. It happened to be a used book, as most of them were. He leaned over to me and whispered, “Bishop’s gotta have a new book.” That got me fired up. I jumped out of my seat and starting doing the famous “Jone-buh Strut.” I was so excited that my new Bishop was taking his role so seriously and understood the powers therein. I immediately requisitioned someone’s new textbook and assigned it to the new Bishop. Bishop Haynes now had his new book. How could I have overlooked the trappings of the Bishopric? In this class, we learned the Claytonic Anthem: “Hail, hail Claytonia…South of Atlanta…We love and adore her…the Mother of Jonebuh…” This was the first verse of the Anthem. I can now see this assembled body standing with their right arms saluting Claytonia with the famous Jonebuh sign. Ronnie Thornton, Jr. was third seat in the middle row. He and others were singing the Anthem and were proud to be Claytonians! (After all, Ronnie‘s father had developed much of Clayton County, including what is now called “The Beach” on Walt Stephens Road.) We had so much fun in those days, and the students learned a lot about Georgia History and History of Minorities in our country — and about power and relationships centered around it. I wanted my students to understand how the world really works. What’s better — reading about Eugene Talmadge and others in Georgia History or playing out how these historical persons performed while they were in office? Though I had lost touch with many of my former students after they went on to college and/or to work, these days many of us have become re-acquainted via Facebook. Ronnie, Eric, Rhett, Norreese, and Julie _______ (I still withhold the last name because of the stigma of “Tattnall County”) are “friends” on Facebook. Today, I am sure that I would never be allowed to teach like I taught back then. I have many of my former students saying that they wish that their kids could have the kind of fun that we had back then. But, the fun has been taken out of public schooling process. So much is based on standardized testing and a narrowly-focused curriculum that does away with a teacher’s creativity and discretion. My former students have raised their families and are working in various jobs. I now get to look on Facebook and see photos of their children. I am very proud of all of them. For example, Eric Jensen serves his community as a Gwinnett County Firefighter. When he was a Seventh Grader, he hated those hot and sweaty summer football practices. I did too. I remember when he was trying to quit football at practice one day, tears were coming down his eyes as he pounded the grass (erh, mostly “dirt” on our field back then) and kept telling his father, “I don’t want to play football!” I nicknamed him “Tiger.” Russ, his father who was a Delta Pilot and attended most of our practices, would not allow Eric to quit. This is what our students need today…fathers who won’t allow their children to quit. As I mentioned earlier, Eric was named First Team All-State in Georgia‘s highest classification as an Offensive Tackle by his senior year at Jonesboro Senior High School. I am glad to see that he has become such a responsible citizen and an example to his two sons. 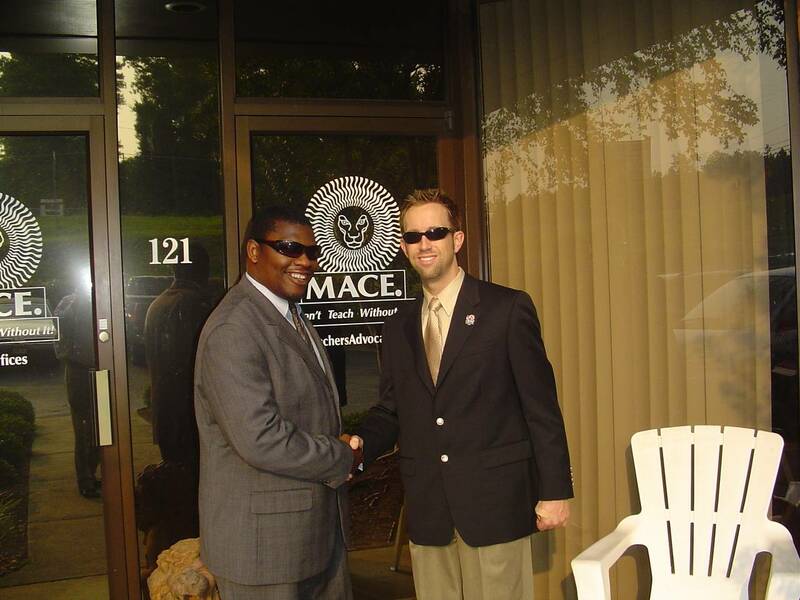 Norreese Haynes (L) with MACE attorney J. Anderson Ramay (R) outside the MACE Office in Fayetteville. Mr. Haynes is Vice President and Chief Operating Officer (COO) of the Metro Association of Classroom Educators (MACE). Mr. Haynes spent the first few years of his life in one of the nation’s toughest ghettos, the projects of Carver Homes of Atlanta before his parents saved enough money to move to Jonesboro when he was in the Third Grade. Mr. Haynes is a shining example of an “at risk” child who became an accomplished citizen. Norreese started working at Riverdale Middle School as a Para-professional, and it wasn’t long before his principals (Shepherd, Tanner, Brannan, and Horton) could see that he could work wonders with the students, especially those deemed as “at risk” students. Norreese relates to me that he finally persuaded one of the principals to let him serve hotdogs to his students. He told the principal: “They’re not going to behave or learn if they are hungry.” The principal finally consented, and Norreese served his so-called “at risk” students hotdogs and proverbially had them eating out of his hands. His basketball teams won four County Championships before he turned thirty years old. They pressed all over the court from the opening whistle until the final buzzer. He held Midnight Basketball on Friday nights and kept many kids off the streets and out of trouble. I am a Son of the South, growing up in one of South Atlanta’s goriest ghettos, Carver Homes. I am what we call in Georgia a “Grady Baby,” born right up the road from “The Ted” (aka Turner Field). Not many people who live in Georgia were born in Grady Hospital (known for its trauma care unit) but those of us who are actually “Grady Babies” know that we share that special fraternity of being from “the Street.” I had a gun pointed at the middle of my forehead with the assailant pulling the trigger, but the gun did not discharge. I was seven years old and already indirectly involved in the drug trade of South Atlanta. (The drug dealers used young boys like me to tote “packages” to others.) I have seen men shot to death in cold blood. I walked to and from Slater Elementary School with a baseball bat to ensure my safety and the security of my valuables (viz., my shoes, jackets, etc.). Finally, my father, who had been working on the back of a garbage truck for the City of Hapeville since he was 16 years old, saved enough money to move our family into a Jim Walter Home (just a shell) in the woods in Jonesboro, Georgia. He got us out of the hell of the projects and into an idyllic setting, though we went without indoor plumbing or walls (we used blankets for walls and doors) for a year or two. I could write a book about my upbringing (and losing an older brother who had been mixed up in drugs and alcohol) and facing abject racial discrimination in my schooling as well as in the workplace, but I only provide you with a peek through my life’s curtain just to give you some sense of how far I have come in life. I first enrolled in Clayton Jr. College (now Clayton State University), eventually obtaining an Associates of Arts degree. Clayton Jr. College was known to be a tough school in the day, and this was a major achievement for me. I then enrolled in Morehouse College (alma mater of Dr. King and other leading lights in the African American community) in Atlanta, but had to drop out after a year because of a lack of money. In those days, I knew nothing about grants and school loans. My parents knew nothing about this. At my majority white high school (with many affluent students), my counselor never discussed grants and school loans with me. (In fact, it probably never occurred to her that I would go to college.) But, after what seemed like many, many years, I finally graduated from undergraduate school, working often times two and three jobs while going to school. I was the first person in my family to ever graduate from college. I have always worked all of my life. My mother worked as a custodian in the school system. Somehow she got to know the very powerful and influential superintendent, Mr. Ernest Stroud. He took a liking to my brothers and me, and we ended up being his fulltime gardeners for years. I worked for the principal (Mr. Paul Robbins) at Jonesboro Junior High and for the principal (Mr. Fred Smith) at Jonesboro High School. Adults tended to like me because I was a hard worker. Many years later, I started working for my former teacher and coach. He is Dr. John Trotter. He is the Chairman and CEO of the Metro Association of Classroom Educators (MACE). I started off as a Field Representative but today I am the Chief Operating Officer (COO) of the union. MACE is probably the South’s toughest teacher’s union. There is no collective bargaining in Georgia. So, it takes a tough union like MACE to get anything done for the teachers. 1 Response to A Fourth of July Tribute To George Washington and the Marquis de LaFayette, and to Some Strong Americans, Norreese Lamar Haynes, Colonel Rhett B. Griner, & Firefighter Eric (Tiger) Jensen. Interesting. I have always thought that creativity (and its close relative, experimentation) should be valued in any profession and in teaching especially. I have observed over my six decades of life that creativity is now being much less valued in return for what bean counters term “repeatable results”. That is why the emphasis on getting high scores on standardized tests has become the norm in most schools. Students can take tests, but retain no real or practical knowledge that they can use in life. Teaching and learning should be fun and creative. I love the concept of how Dr. Trotter taught history and I’m sure his students retained a lot of the practical knowledge.